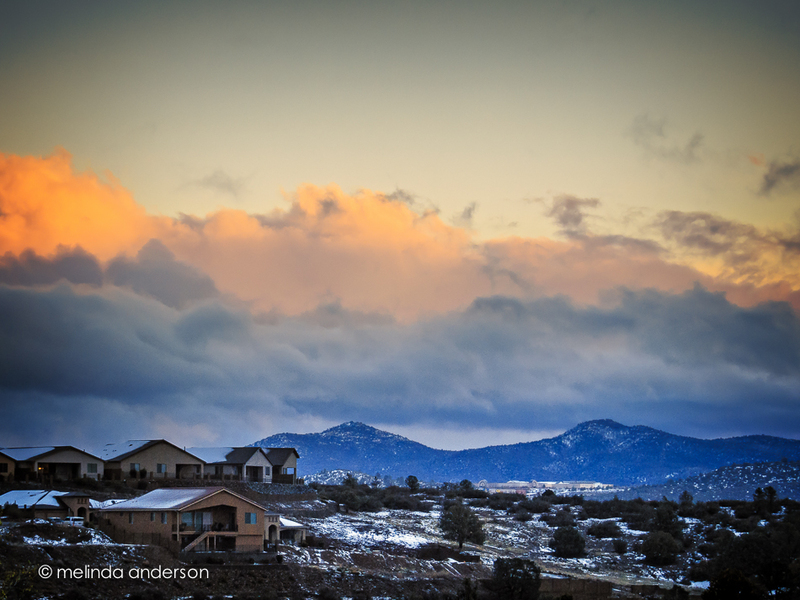 We don’t have snow all winter long in Prescott- at least not since we’ve lived here- so each snowy day is like a gift. Of course, people who have lived here for awhile tell me to be careful what I wish for and then relate tales of the winter of _____ (supply your own year). I have no desire to experience winter like most of North America has had this year; I just would like a bit more of the pretty white stuff. Yesterday, a snowstorm was predicted above 5500 feet (our house is at 5470), and we were predicted to get a “wintry mix”- rain and snow. It had rained steadily during the night, and about 8:00am, it turned to snow. LOTS of it! I was without my Nikon for yesterday’s snowstorm, so I had to make do with my iPhone and my husband’s Canon Powershot SX50. The photos below were taken with the Canon. I’m trying to learn this nifty little camera and managed to take the still shots with aperture priority and the birds with shutter priority (at least I THINK so. . .). It was a whiteout for most of the morning. The birds didn’t seem to mind. This entry was posted on March 3, 2015 by Melinda. It was filed under around the yard, birds, landscape, weather . So glad you showed this, I was wondering if you got snow, I love the rain and it was just so wonderful yesterday and refreshing. Beautiful images and I am sure you were wishing you had your big girl camera but these are quite nice. So glad you a spending time learning a new camera. Hooray you finally got the snow you wanted! Love the last picture– what beautiful color inthe clouds! Hooray you finally got the snow you’ve been wanting! I love the sky colors in the last shot!